A new form, with a focus on technology development and decommissioning of nuclear facilities. SKB’s programme for research and development has been submitted to the Swedish Radiation Safety Authority and will, after extensive referral for consideration and comment, be treated by the government. Every three years since the mid-1980s, SKB has, in accordance with the Nuclear Activities Act, reported their continuing plans in a specific programme for research, development and demonstration, called the RD&D programme. The RD&D Programme 2016 was submitted to the Swedish Radiation Safety Authority in late September and thereby became the fifteenth in the series of RD&D programmes. 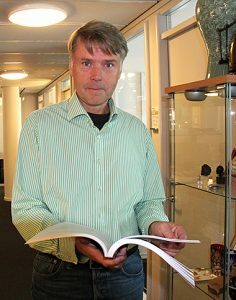 Coordinating programme manager Anders Ström browsing through the freshly printed RD&D Programme 2016. Photo: SKB. The programme was submitted at a time when SKB has two ongoing licensing matters with the Authority, one concerning encapsulation and final disposal of spent nuclear fuel and the other concerning the extension of SFR, the final repository for short-lived radioactive waste. Anders Ström is the coordinating programme manager at SKB and responsible for the programme. – We have come very far in both licensing matters and in the RD&D Programme 2016 we develop the plan of action and describe the work that remains in order to construct and commission these facilities. We also describe the development required for the future construction and operation of the final repository for long-lived waste, SFL. We also discuss what flexibility we have in the system, if conditions should change over time. When the Government approved the RD&D Programme 2013, it demanded that future programmes should be clearer and more structured, and that they should clarify how research and development activities are planned, justified and evaluated based on legal requirements. Therefore, the programme now submitted has a new form and structure. Part I, where SKB’s activities and the plan of action are presented, has become more extensive and describes everything from plans for new facilities and decommissioning to plans for research and development activities. – We have linked all activities to the stepwise decision process that determines how new facilities are developed and put into operation. The technical solutions become more detailed as the process progresses. We have tried to make this clearer in the RD&D Programme 2016, Anders Ström explains. The second part of the programme, waste and final disposal, describes the research and technology development in more detail for the next few years. It involves increasing knowledge about the processes that will affect the repository after closure, but also the design of repositories, construction, manufacture and installation of repository components as well as how these components are inspected. – We need more knowledge to further develop the technical solutions that will be used during construction and operation of the repository, which is why we see a transition to more detailed technology development, says Anders Ström. A new factor affecting SKB’s planning is the decision that has been made on taking the oldest reactors in Oskarshamn and Ringhals out of service earlier than intended. The decision has an influence on SKB’s planning in several ways, among other things, it has become increasingly important to solve the issues of decommissioning. This is reflected in the RD&D Programme 2016, where decommissioning of nuclear facilities has received greater focus and is discussed in a separate part, Part III. – New forecasts from the nuclear power companies raise questions concerning interim storage of both the spent nuclear fuel and the low- and intermediate-level waste. These questions are handled in the current programme, Anders Ström says. SKB has, on behalf of and in cooperation with the nuclear power companies, developed the RD&D Programme 2016 and submitted it to the Swedish Radiation Safety Authority. The programme is then referred for consideration and comment to regulatory authorities, universities and institutes of technology as well as the municipalities concerned and several other stakeholders. Finally, it is up to the Government to determine whether SKB, through the presented plans, can fulfil their task of managing and disposing of the radioactive waste and the spent nuclear fuel in a safe manner.